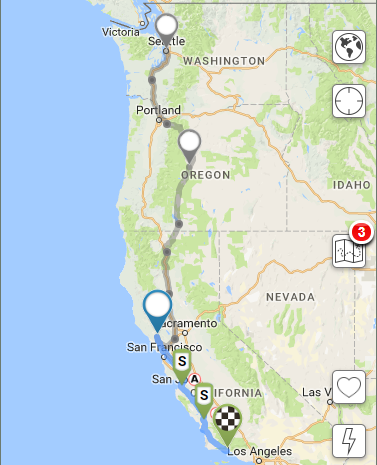 Planning overnight stops using Tesla’s Find Us database of destination charging locations. Whoa. That’s a lot of HPWC destinations! Today we’ll be planning a three-day road trip from Seattle WA to Santa Barbara CA. 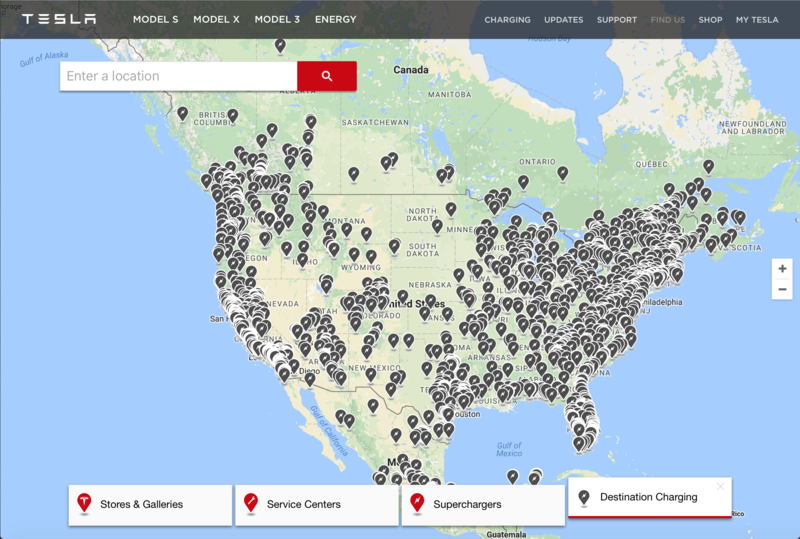 We’ll be using Tesla’s Find Us website to identify hotels with HPWC chargers, aka destination chargers. We’ll use top-down trip planning to establish our ultimate destination, add two overnight stops along the way, then let EVTO work its magic to determine the best routing between our destination charging stops. We’ll start by finding a hotel in Santa Barbara with destination charging. Open Tesla’s Find Us website. In the Enter a Location search field, enter Santa Barbara CA. At the bottom of the Find Use webpage, enable only the Destination Charging tab. For this tutorial, we’ll be staying at the Fess Parker Doubletree Resort on East Cabrillo Boulevard. Touch the Destination field. The Destination Charger Filter will display. Destination Charger Filter: select Destination Chargers from the list. Destination: type fess. From the list of results, select 633 E. Cabrillo Blvd, Santa Barbara CA. Destination Charger Type: Verify Tesla WC 8.32kW. Time: Select a departure time of 8 AM. Date: Select tomorrow’s date for our departure. We’ve got some friends in Bend OR that we haven’t seen for awhile. Let’s search Bend OR on Tesla’s Find Us site to see what’s available. The Oxford Hotel looks like a good spot for our first overnight, with two 13kW HPWC connections. There are many ways to add stops (waypoints) using EVTO. Above we demonstrated how to use the Destination Charger Filter to select from one of the predefined supercharger or Tesla destination locations. In this step we will use the map interface to define our overnight stop. Both ways have advantages and disadvantages depending on your situation. You can choose either method or even free form it by entering the same information yourself. EVTO is very flexible in this regard. From the Plan screen menu, select Filter Chargers. Place a checkmark in the Tesla HPWC list item and select Save. Pan and zoom the map to Bend Oregon. Select the lightning bolt map icon to turn on the charger locations. In the center of Bend you will see a empty red charger icon with an (H). Select the one that states The Oxford Hotel on Minnesota Ave. You will note that this location has two Tesla connectors up to 13 kW. Select the pushpin icon on the popup to add this location as a waypoint. The empty red symbol will be replaced by a filled in red icon. We won’t be using the charger icons again for this tutorial so return to the Filter Chargers and uncheck the Tesla HPWC list item and select Save. Select the lightning bolt map icon to turn off the charger locations. 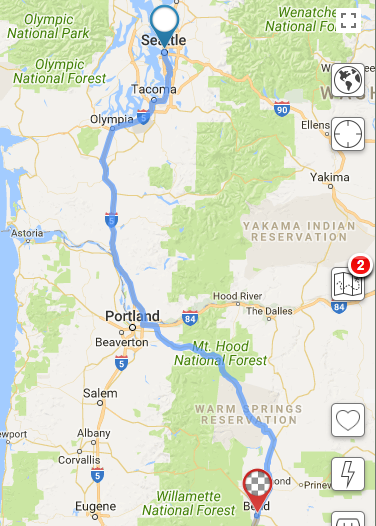 Because this will be our first overnight stop, we’ll create a segment by splitting our route in Bend. This split point will mark the end of our Day 1 segment, and the beginning of our Day 2 segment. Touch the new solid red pin labeled with H (representing a Tesla HPWC charger). It’s currently red, meaning we haven’t planned any charging stops. No worries. Touch the scissors button to segment our route at the Oxford Hotel. Touch Segment to confirm the split. The map button now displays a red ‘2’ badge, indicating that our trip now has two segments. The solid red pin labeled with H has now been replaced with checkerboard red pushpin with a grey center, similar to our final destination in Santa Barbara. This designates a segment destination vs the black checkerboard in the final trip destination. Our trip after segmenting at Bend. We haven’t asked EVTO to optimize the chargers yet, hence the red destination pin in Bend. You will also notice that the route below Bend is gray, indicating it’s part of another segment than what is being viewed. Also notice that the title at the top of the App has changed to The Oxford Hotel, the name of the current segment. We’ve got some EV enthusiast friends in Santa Rosa CA itching for a ride in our Tesla. Search Santa Rosa CA on Tesla’s Find Us site to see what nearby hotels are available. The Hyatt Regency Sonoma Wine Country is centrally located in downtown Santa Rosa, with two 16kW HWPC connections. In this step we will demonstrate a third way to choose a destination charging stop, one that you enter the details in manually. Touch the gray route line just below Bend to toggle the trip to the second segment. From the Plan screen menu, select Add Waypoint. In the Search field, enter Hyatt Vineyard. From the displayed list of matching results, select the Hyatt Regency Sonoma Wine Country on Railroad Street in Santa Rosa. Touch Save to add this waypoint to our route. We’ll create another segment by splitting our trip in Santa Rosa. This split point will mark the end of our Day 2 segment, and the beginning of our Day 3 segment. Touch the red H pin at Santa Rosa. Touch the scissors button to segment our route at the Hyatt Regency Sonoma Wine Country. Touch Segment to confirm the split. The map button now displays a red ‘3’ badge, indicating that our trip now has three segments. The next step is to let EVTO optimize our route by factoring in our overnight stops and predicted weather conditions along our route. Select Refresh Auto Chargers from the Plans menu. After a few moments the status bar should disappear and the first segment of the trip should display. With our car configuration and current weather conditions, EVTO suggests two charging stops on day 1 before arriving in Bend. Your mileage may vary. Our visit to Bend will give us enough time to catch up with our friends over dinner. We’ll depart from Bend the following morning. Touch anywhere along the second segment to activate that segment. Review the second segment chargers. Note that EVTO has us stop at the Vacaville supercharger and fill up before proceeding to the hotel to finish the charge for the next days trip. EVTO will favor the faster charging of the supercharger than the slower charger of the hotel. If you are confident that the hotel charger would be available for your extended use, you could just delete the Vacaville supercharger and rely solely on the slower hotel charger. Touch anywhere along the final segment to activate it. To zoom the map to your entire trip, encompassing all three segments, touch and hold the globe button (a long press). We can heartily recommend the Huevos Rancheros at Fess Parker’s Roundhouse restaurant breakfast menu.